The Cat Mate C3000 Automatic Feeder is ideal for both dogs and cats, designed to ensure your pet receives the perfect amount of dry food at specifically chosen times. This helps to minimise health risks caused by over- or under-feeding. 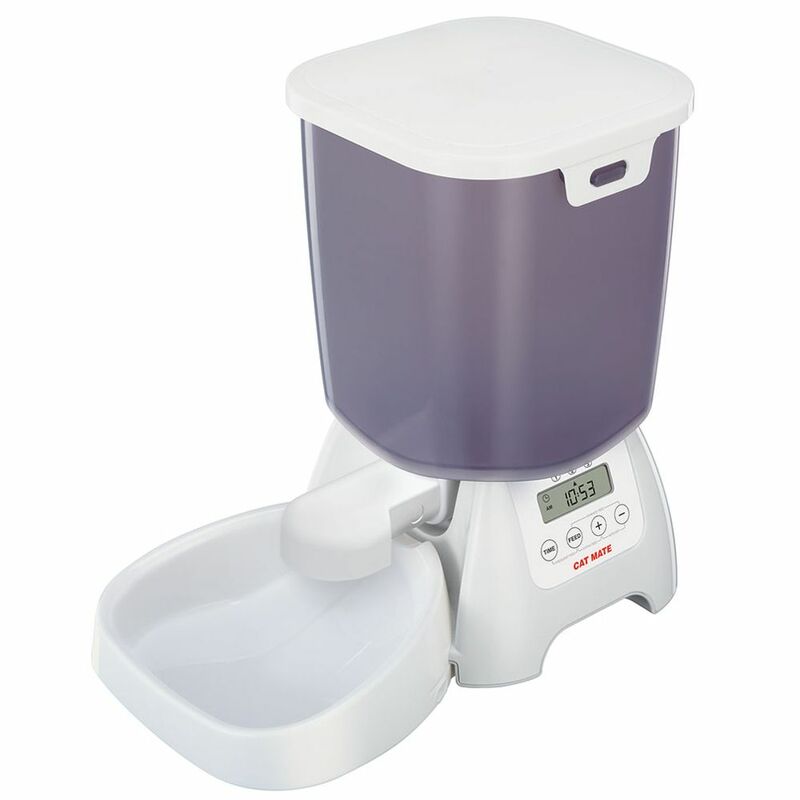 The Cat Mate C3000 Automatic Feeder has an extra-large capacity of 3kg of dry food. It can automatically deliver individually portioned food throughout a 24-hour period, thanks to an LCD programming system, which is easy to understand and use. The portion size for each meal can be for anything from 10g upwards, approximately 2 teaspoons. Alternatively, you can release a portion of food for your pet by the preΒ of a button, outside of the programmed times. There is also an option to provide lots of smaller meals throughout the day, which can be an ideal option for pets with specific dietary requirements such as diabetes. The Cat Mate C3000 Automatic Feeder includes a secure Snap Lock and a patented self-closing nozzle, in order to ensure that your pet cannot reach in and get food when it is not meant to. The base can also be installed on a wooden plate for increased stability. The automatic feeder is battery-operated, requiring 4 x C-batteries that are not included in delivery. The battery life level can be seen on the display. The entirety of the Cat Mate C3000 Automatic Feeder is simply to clean, with the bowl, container, lid, nozzle and delivery tube all being dishwasher proof. The base unit can be wiped clean with a damp cloth, but it should not be submerged in water. Cat Mate C3000 Automatic Feeder at a glance: Dry food automatic feeder with digital timer Suitable for cats and dogs Feeding container with 3kg capacity and portion dispensing from 10g upwards LCD display for easy programming 3 feeding times per day: or manual feeding by a button Easy to clean and dishwasher proof: all food-related sections (bowl, container, lid, nozzle and delivery tube) With Snap Lock lid catch: to make it pet-proof! Capacity: 3kg dry food Battery operated: 4 x C-batteries (not included) 6-9 month lifespan with daily use With battery life indicator on display Material: Plastic 3 year guarantee. Price just £59.99! Click here to buy now!